Protecting your hands when you perform high-risk tasks is integral, particularly if you're handling irritable substances. The Shield GI/500 Bi-Colour Rubber and Chloroprene Industrial Gloves provide excellent protection against a number of chemicals. The chloroprene coating on the palms of the gloves also protect against fat and oil so you're able to retain your grip. The Shield GI/500 Industrial Gloves have been evaluated in terms of their suitability for coming into contact with food. The gloves have passed the test and are therefore suitable to do so. The GI/500 Industrial Gloves are designated Category III gloves, meaning that they should be suitable for most high-risk tasks. Complex in design, they help protect against fat, oil and chemicals while also improving your grip on objects. The Rubber and Chloroprene Work Gloves are available in four sizes to suit a wide range of users. Please measure the circumference of your hand around the knuckles (excluding the thumb) with your hand open and your fingers together, and the length of your hand from the tip of your middle finger to your wrist. 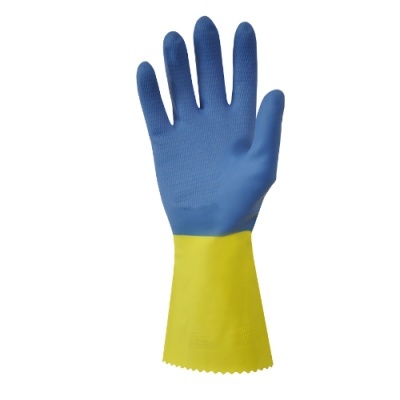 The Bi-Colour Industrial Work Gloves have a minimum length of 300mm. Please note that, although one glove is pictured, these gloves are supplied as a pair.